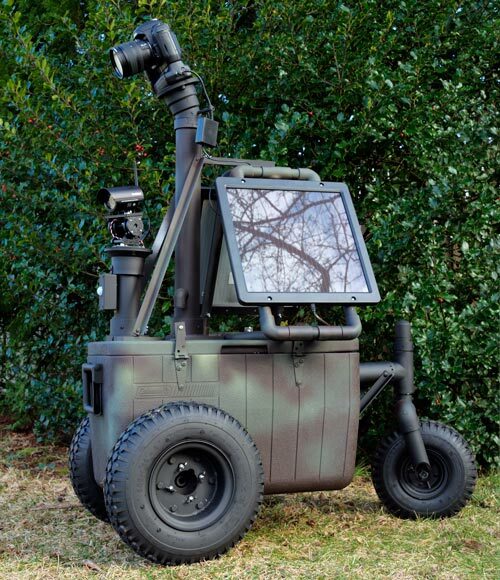 CoolerBot is built as an outdoor telepresence robot that is used for nature photography and surveillance. It is both rugged and waterproof and designed to stay outdoors for long periods of time. It was built using a 48-quart Coleman cooler and sports an infrared video camera, a Nikon digital SLR camera and two solar panels used to recharge the motor and logic batteries. Currently CoolerBot is remotely controlled telepresence robot. Basically you need to drive it somewhere and then take your pictures. The next step is to add some autonomous functions that would allow CoolerBot to navigate on its own to a location using GPS as well as sensors to avoid collisions and cliffs. This would be very much like the requirements needed for a Robomagellan competition. With this capability CoolerBot could be sent on autonomous overnight patrol and then you could download the pictures it captured the next morning. You can read all about CoolerBot in the March/April 2010 issue of Robot Magazine. 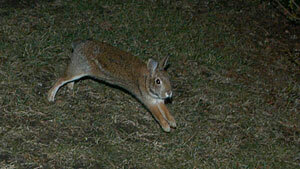 Here is a rabbit caught by CoolerBot's camera while it was on night patrol. No bunnies were harmed during the making of this photo. You can see a YouTube video of CoolerBot in action below.